Have faith. The Mach is indeed a gorgeous ship, and also lethal. Have no doubt that fozzie and/or rise will ruin it in the next 6-8 iterations of Eve. Ah, the space pecan. One day, I will own one. It is weird, isn't it? I find myself able to fly all these ships that I was in awe of as a newbie and there's part of me that things, wait, when did that happen? The people who were flying those ships are now in capitals, but I could train into those whenever I want to. 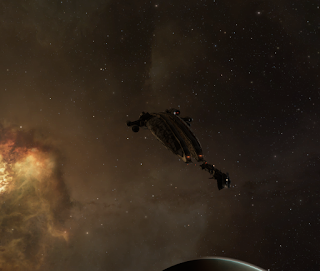 I don't think such linear progression really exists in EVE. I was flying frigates in cruisers in 2008 and I still prefer flying those in 2015. I own a few Mauraders, but do I love them? Not really they're just convenient when I want o run certain content. I've always looked at ships more as tools then as goals. As you become a veteran more tools become available, weather or not you actually need them though, depends mostly on more abstract choices about what you want to do in EVE itself I find, if that makes sense? Well, there's a quasi-linear progression in the skill system, but you missed an admittedly subtle deviation from the parallel when I implied that I'm no great hurry to train into capitals. They just don't excite me. When you're new, though, everything's possible and so everything's exciting. I have a Mach story... When I was but a nubbins, mebbe 3 or 5 months ingame, before we dived into Anoikis never to return, we used to live in Soshin and hung out in Dodixie alot. One day a bunch of us were hangin on the Dodi undock and just bullshittin... and the talk came round to your Dream Ship. Seems I didn't have one. I really didn't. I was perfectly happy as I ground my way up the skill tree to learn each new hull and class as Aura whispered, "Skill training complete..." Back then I was pretty deep into the Winmatar and Hate Amarr thing so I was pretty much just into the Matari hulls. Then one of the guys, Alri, said "Tur, there's gotta be a ship you want..." right as a Mach undocked... I said, "Well, if there was it'd be that one but I won't ever fly Amarr so meh." I mistakenly though the Mach was an Amarr ship... remember I was really really new ok? Alri advised me that the Machariel is based on an ancient Jovian design uncovered by the Angel Cartel, and yet it has Gallente and Matarii projectile bonuses... huh. At that point I said, "Well, hell... seems I do have a Dream Ship after all." A little while alter Alri says, "Tur, you got a contract up."... "Huh?" says I.
Alri gave me a Mach hull... just for 'cause. I was floored. Argued I needed to give it back and he wouldn't have none of it. "Nope, gifts' a gift man. You can sell it or lose it or blow it up, but I gave it to you and don't want it back." It was actually most of a year before I could even sit in it... longer afore I could fit it well and even longer before I could fit it acceptably for Incursions... something I have yet to do. I have taken it into most of the holes we have lived in, only ever used it for a few POCO bashes and have never PvE'd or PvPed with it once. Still have that very same hull to this day. Strange how much it means to me... Alri has left the game and I miss my friend. I love this game and the people I know and have known.